A Very Happy Un-Birthday to you. 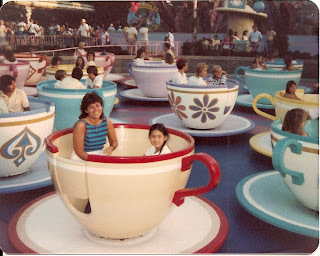 When I was a kid, I loved the Mad Hatter's Teacups at Disneyland. My Disney memories are full of my mother spinning our teacup so fast, I thought I'd lose my lunch. Happily, the tradition of making your child vomit in our family continues... Good times. When the Kennedys do Disney, we do it BIG! Invitations were extended to some of our closest friends to meet up with us at Disneyland and take advantage of some of the amazing perks of just being our friends (AKA Dave's company perks). Truth be told, we weren't complete without a few families that bowed out for various reasons... like a little old trip to Hawaii. Sheesh. But we pushed on bravely. It was an amazing week full of Disney magic, the California sunshine, cinnamon-y churros, and cupcake espionage. We met the Hatch Family for dinner in Downtown Disney and caught up on all the latest - including meeting Carson, their newest addition. 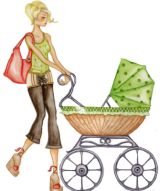 We facilitated the introduction of the Fyans Family to Alice and the Mad Hatter, which fascinated baby Davis. We let Amelia pull Minnie's ears even though mommy said, "no". And, we let the Mosses get the very last photo with Cinderella before her big performance onstage at Disney's California Adventure. We can try to take credit for all of the fun this trip brought, but really, it was all the magic of Disney. This quickly turned into our annual trip with friends! Mark your calendars now for February 2009! See ya' real soon, Mickey! February found Amelia visiting Grandpa John and Grandma Lora, Uncle Bill and Aunt Jenn, and Great-Grandma Rheta, Uncle Kyle, Aunt Heather, and cousins Noelle and Jackson in California and loving every bit of the attention. Amelia also made the rounds to many of daddy and mommy's Fresno friends.